Winning an international Music Competition is an achievement worth celebrating, particularly when the celebrations are financed by a BD1,000 First Prize. 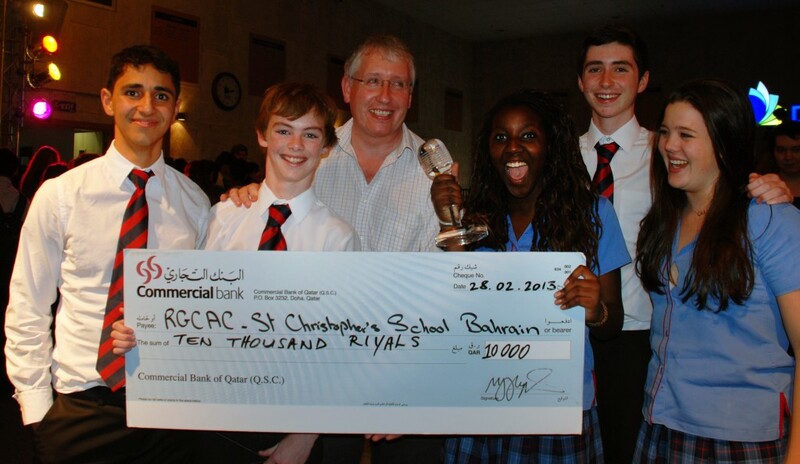 St Christopher’s Rock Band RGCAC entered the Doha College Battle of the Bands and walked off with the First Prize. The hard work in rehearsals and the modest, quiet progress paid off big time when Robyn Durnford, Gabby Liandu, Chris Egan, Ali Jasem and Callum Haggarty travelled to Doha to play against bands from Qatar and Abu Dhabi, and returned to Bahrain with the first place trophy and the significant cash prize. Judges from the Music and Media industries chose RGCAC as the eventual winners, in the face of overwhelming and highly vocal home support for Doha College’s Masters of the Machine and the particularly talented The Komondors from the British School of Al Khubairat (Abu Dhabi) who were each placed in the top three. RGCAC’s arrangement, vocal harmonies, musicality and communication skills were all commented on favourably by the panel of five judges. It was standing room only in the packed theatre at Doha College and whilst the home fans gave all of their support to their local favourites, there could be little doubt that the best band won. Kudos to Mr Alberto Sorrentino and the Music Department at Doha College for staging such a fun and exciting event. It was also noticeable how mutually supportive each of the competitors were and the magnanimity displayed by bands who competed but were not placed was particularly refreshing. The ability to congratulate the winners on the part of the other bands is to be applauded and something to be encouraged. There is no doubt that this event is now a fixture on the local musical calendar and something for St Christopher’s Rock musicians to look forward to. It shows that it is possible to be successful, modest and mutually supportive.